The Tiger rank is for boys or girls who are in first grade or are age 7. To earn the Tiger badge, a scout must complete six required adventures with their den or family and one elective adventure of their den or family’s choosing. As the scout completes each adventure, they will receive the adventure loop for that adventure, which can be worn on their belt. 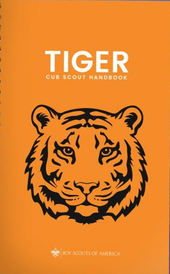 When the scout has completed the seven required adventures, he or she can receive the Tiger badge. The Tiger badge is given to the scouts adult partner at the next pack awards ceremony. After a Scout has earned the Tiger badge, a Tiger Scout can work on the remaining 12 Tiger electives until they finish first grade (or turn 8 years old). They can choose elective adventures that may show new hobbies and teach skills that will be useful during their Scout BSA years. When the Scout completes an elective adventure, they receive an additional adventure loop to wear on their belt.